Our 5oz bar soap is made with nourishing goat milk and yummy scents. Our own homemade Goat Milk Lotion is made with fresh goat milk, shea butter, avocado oil, and sweet almond oil. Our salt and sugar scrubs are great for exfoliating and moisturizing in the shower. Made with coconut oil to leave your body silky smooth. Twin Willows No-Pu Shampoo is a biodegradable, all-natural, vegan shampoo made with castille soap. This shampoo uses peppermint essential oil to stimulate and cool the scalp for an invigorating experience. 16 oz Pump Bottle. Twin Willows ​Peppermint Conditioning Treatment is an all natural, vegan conditioning treatment made with organic coconut oil. Can be used as a deep conditioner or a finishing balm. 8 oz jar. Facial hair needs care too! ​Beard balm and beard oil hydrates the hair and skin, prevents beard flakes, and keeps coarse hair neat and smooth making your beard touchable, soft, and tangle-free. Smoking in the Woods- Fresh, clean aroma with top notes of bay leaf and fir needle mingled with cedarwood and crisp bergamot which reveals a warm tobacco base note. 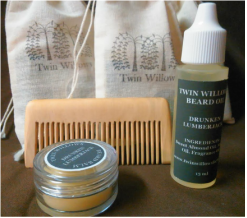 Beard Kit Includes One Beard Balm, One Beard Oil, and One handcrafted wooden comb in a drawstring muslin bag. Luxuriously silky, and perfectly flavored with peppermint essential oil. Our lip balm is most similar to Burt's Bees. Comes in a convenient 1/4 oz. Sliding Tin. ​Place your order below. You will be invoiced via email within one business day. ​CASH, CHECKS, CREDIT/DEBIT, PAYPAL Accepted.